I woke up this morning with a craving. I wanted that ^. 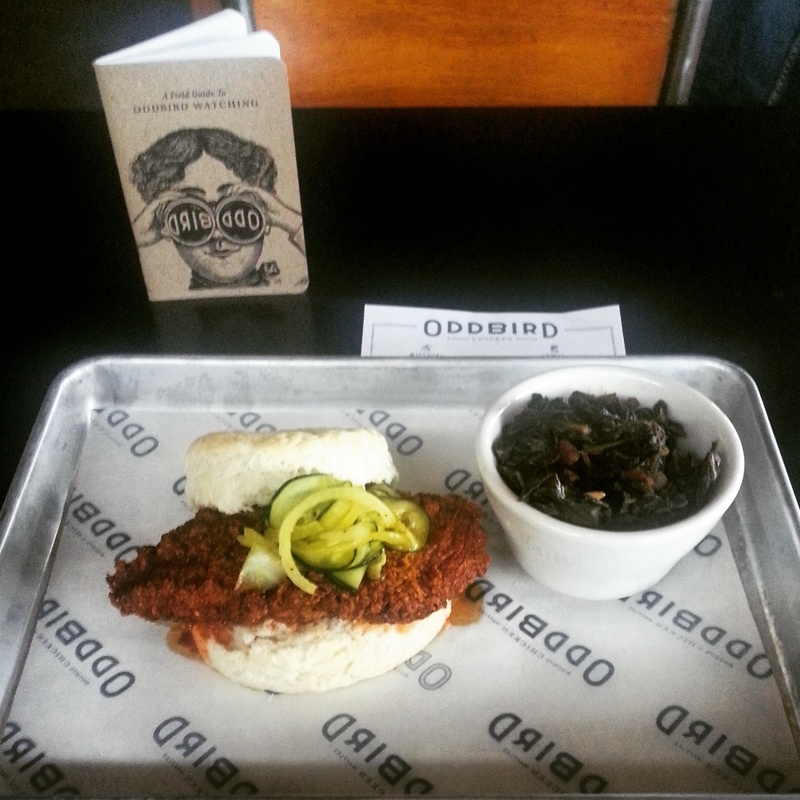 I wanted that Hot Chicken Biscuit with homemade Bread & Butter Pickles. That one ^. Right up there ^. I am a lover of all things chicken. I have been since I was knee high to a grasshopper. Translation for non-Southerners: Since birth. I’ve raised chickens, had pet chickens, hypnotized chickens ( <– story for another time) and eaten chickens, and I have to say, this is one of THE best pieces of chicken I’ve ever eaten. Close your ears mama. 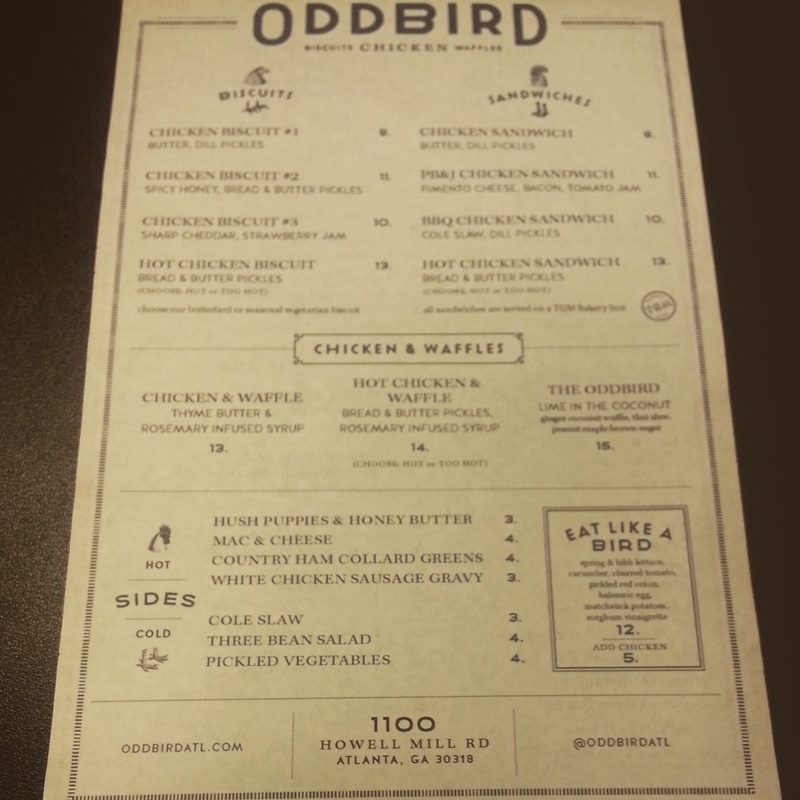 Tuesday night I was invited to the “Hatching Party” for West Egg Cafe’s new alter ego, Oddbird Biscuits, Chicken & Waffles. This is not an ordinary restaurant, but instead is a pop-up restaurant concept located in West Egg Cafe; a restaurant inside a restaurant. Pop-Up concepts are kind of like Cinderella’s pumpkin. On Wednesdays-Saturdays, 5:30-9 p.m., West Egg’s persona morphs into Oddbird, and the menu transforms into offerings of PBJ Chicken Sandwiches (Pimento Cheese, Bacon, and Tomato Jam), Ginger Coconut Waffles with Thai Slaw and Peanut Maple Brown Sugar, Thyme Butters, Rosemary Infused Syrups and that Hot Chicken Biscuit up there with Homemade Bread & Butter pickles. Droolfest 2015. 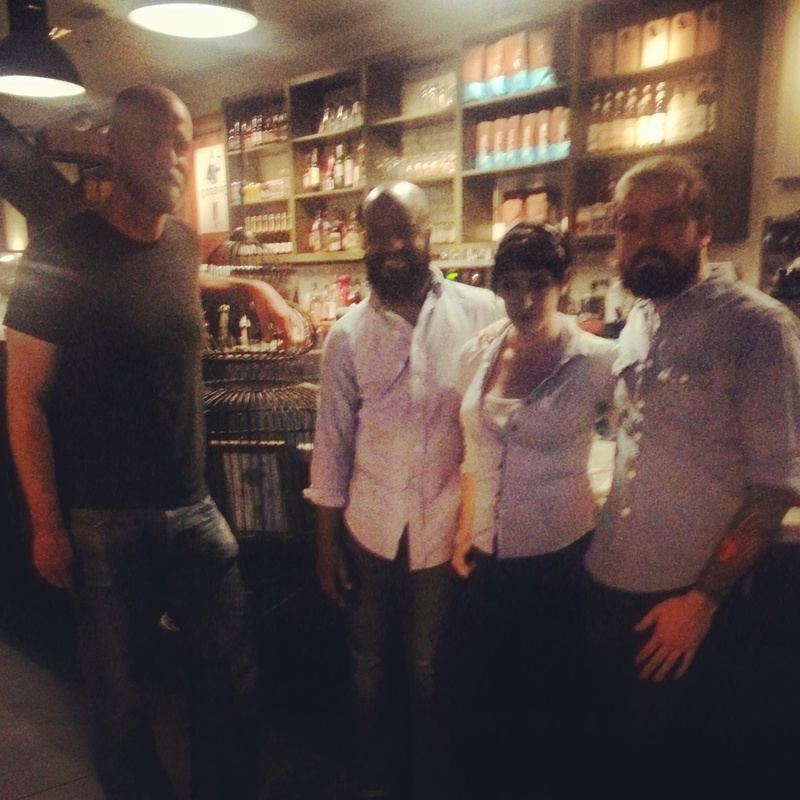 I had the pleasure of meeting Oddbird co-owners and partners Ben Johnson, his wife Jennifer Johnson and Shelley Sweet. 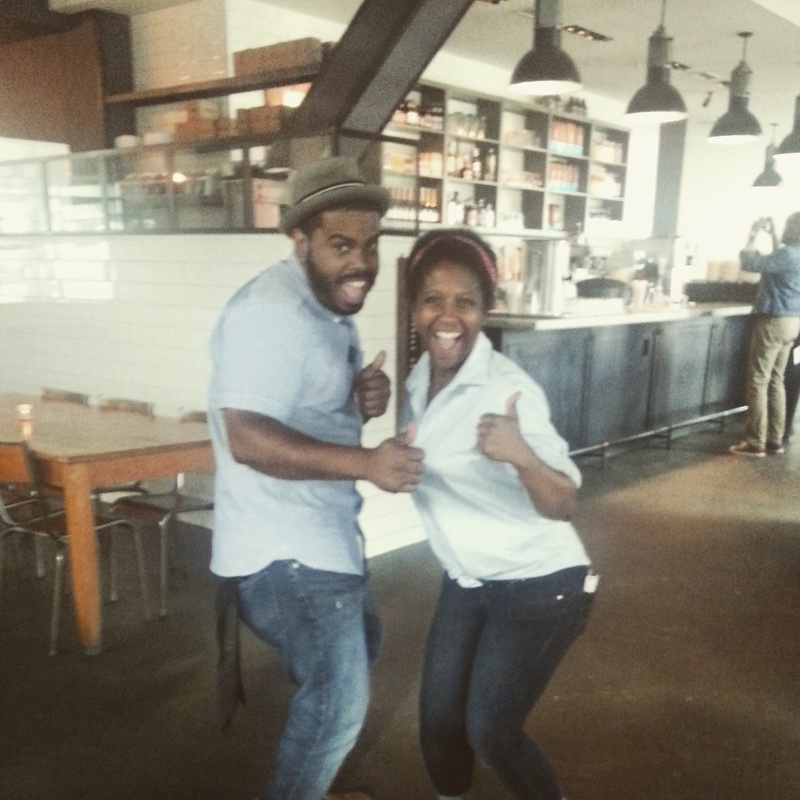 “We really wanted to give our chefs an opportunity to be creative and have fun! 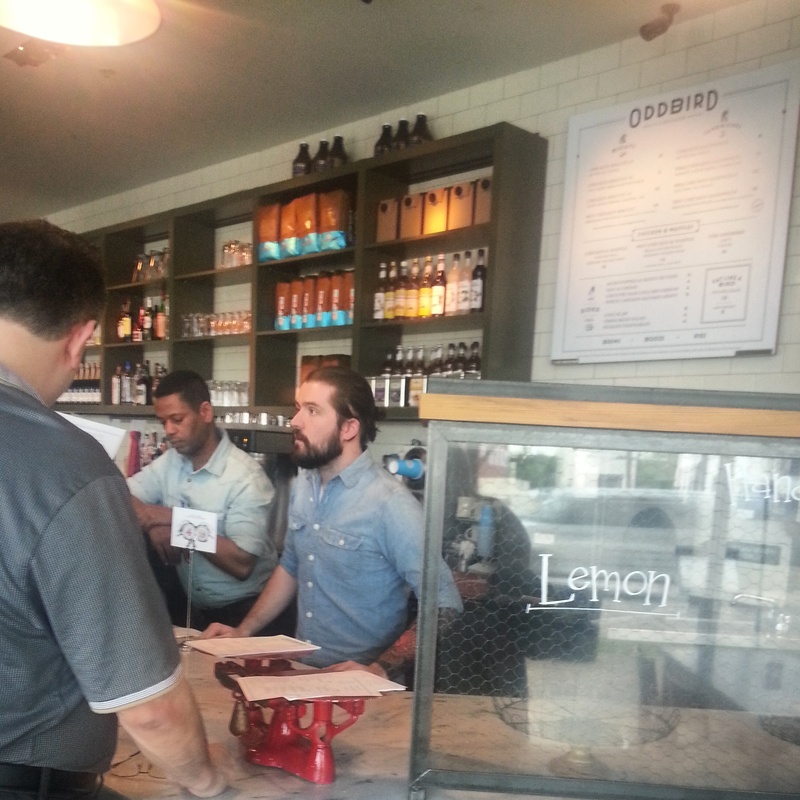 We wanted the branding of Oddbird to really stand out, and most importantly we wanted to give our customers not just a good meal, but an overall experience,” said Sweet. Based on 25 years of professional marketing experience, I would agree there was definitely attention paid to the branding and fine details for Oddbird. There was also attention paid to finding the right crew for this creative concept. 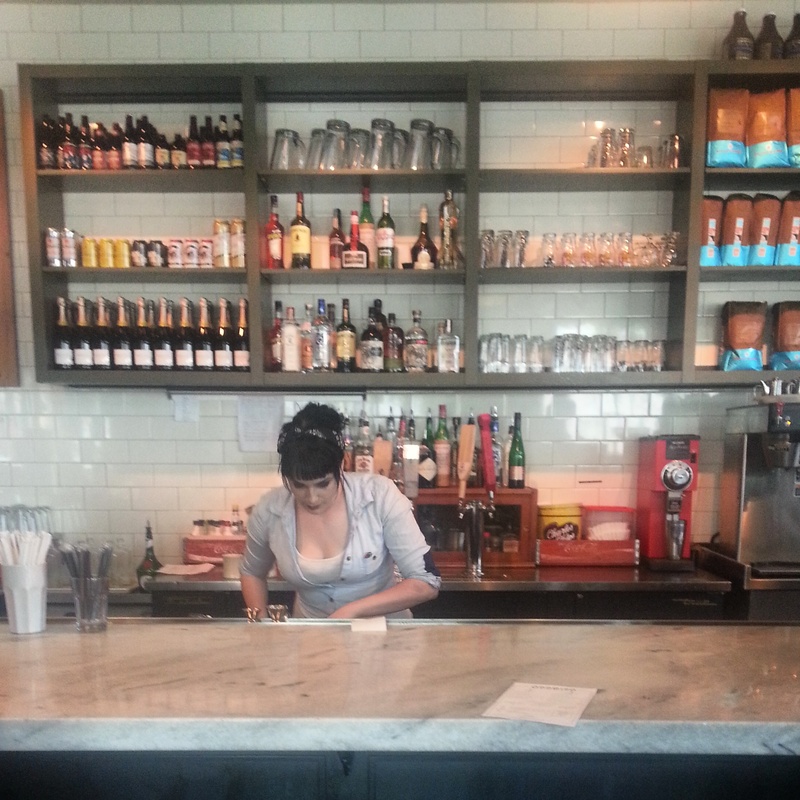 People make a restaurant and Oddbird certainly has the right people. The staff was filled with energy and excitement, with our waiters and waitresses describing in great detail their favorite menu items and what they just couldn’t get enough of. With that much excitement surrounding the menu, I couldn’t wait to take my first bite. I allowed the staff to choose my meal. They selected the Hot Chicken Biscuit with Homemade Bread & Butter Pickles, Country Ham Collard Greens and their soon to be famous, Sorghum Pecan Pie with Orange Zest Cream. But first…we started with cocktails. What proper Southern lady wouldn’t? This is the Ladykiller. 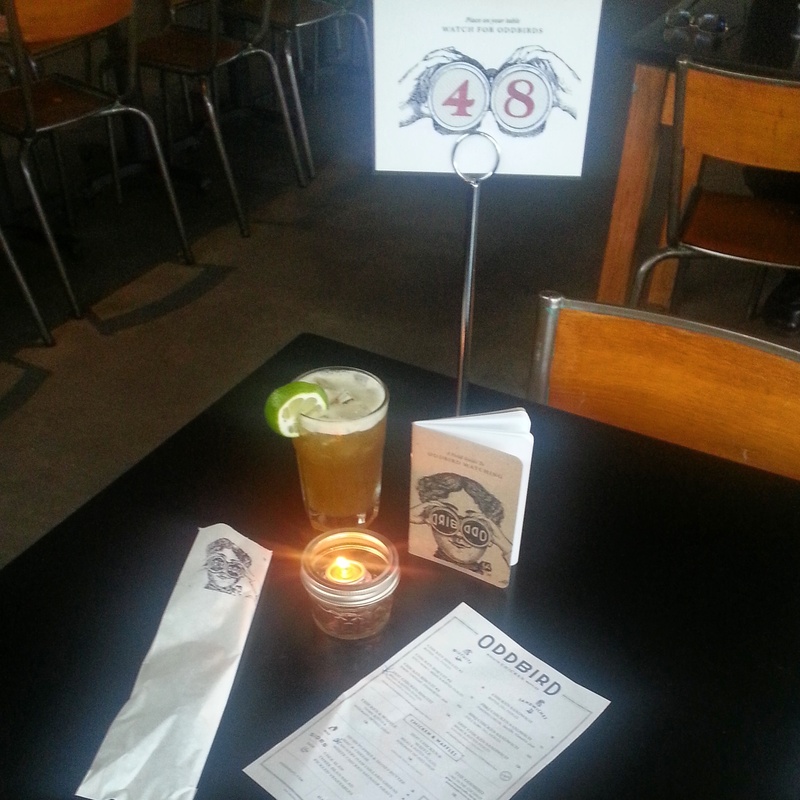 It is a fantastic blend of Espolon tequila mixed with Pimms, ginger and pineapple. Espolon is 100% agave, and made in Los Altos, Jalisco. The cocktail had an easy drinkability with a nice finish of ginger, perfect for summer sipping. Both the collards and the biscuit were excellent choices. The collards were tender and cooked in a silky, rich ham base. They offered a little salt and a lot of sass with just the right amount of kick at the end. The chicken biscuit was HUGE! Do you see this? I can’t even. Homemade Bread & Butter pickles topped this perfectly seasoned Springer Mountain chicken breast. I can’t quite say the pickles beat mama’s, but I will firmly say they are a VERY close second! <— BIG COMPLIMENT. 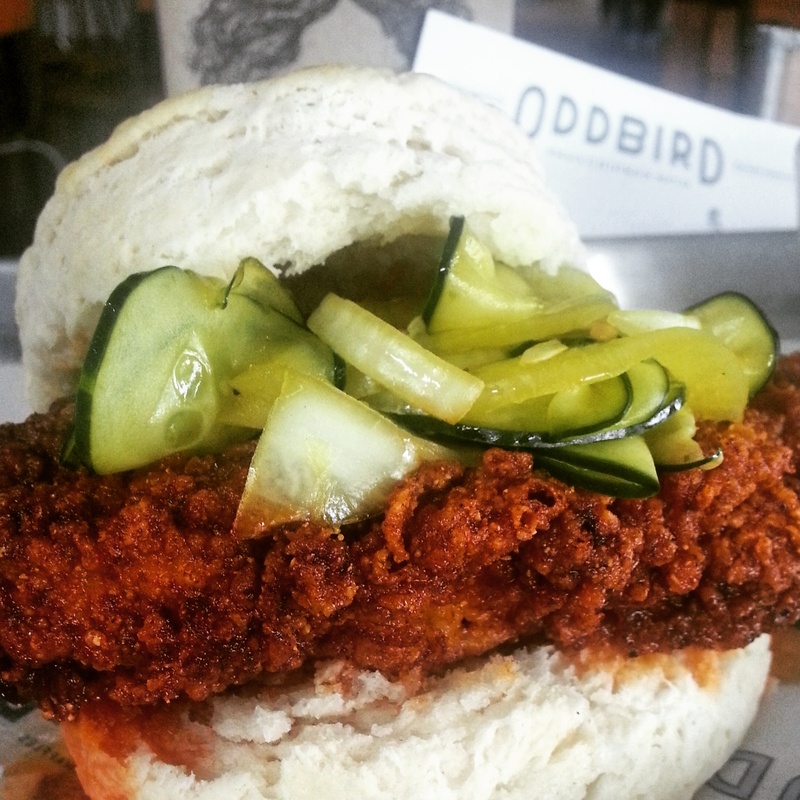 The heat in the chicken was balanced beautifully with the sweetness of the pickles and of course with the crazy tender homemade biscuit that was out of this world. If you’re going to offer biscuits, this is how they should be offered. Just when you think you have absolutely no more tummy room, you’re ready to take the belt out a few notches, and order a wheelbarrow for curb service, comes this. I’m not even kidding y’all. 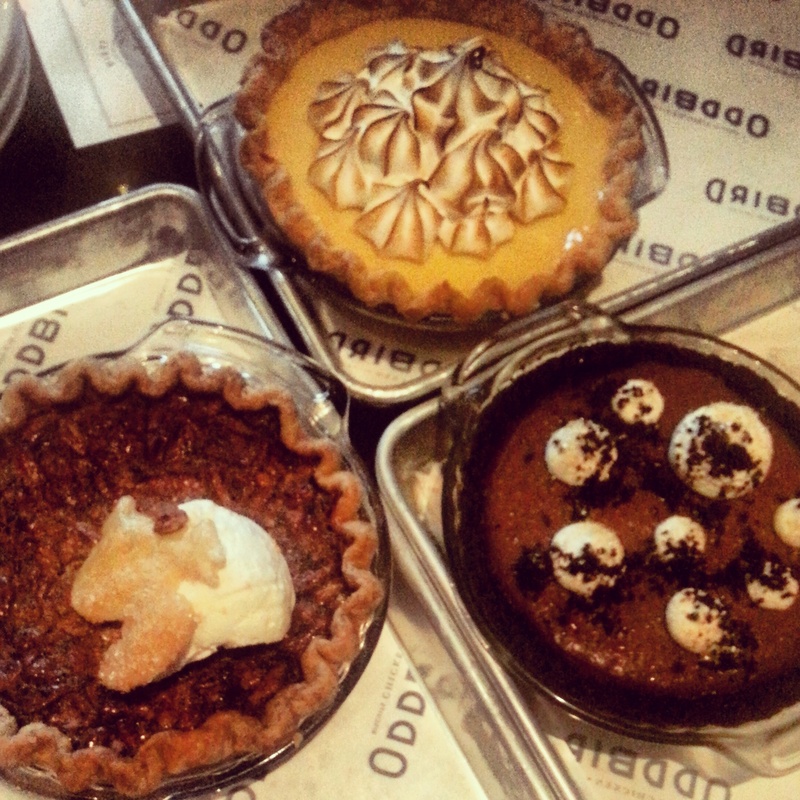 Three of the most decadent pies you will ever try. 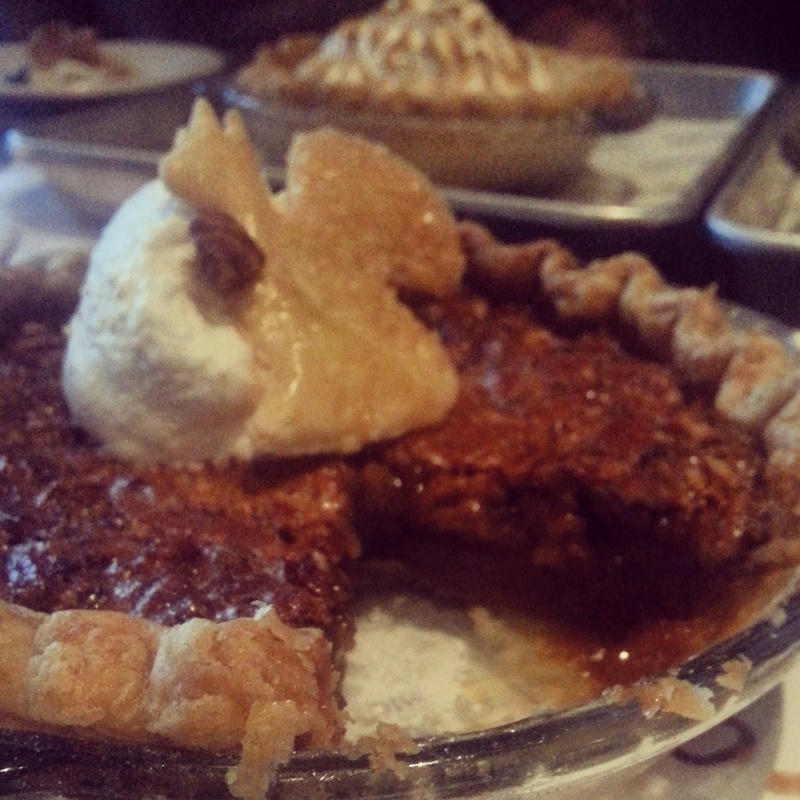 We anxiously sampled each pie (I had more tummy room…who knew! 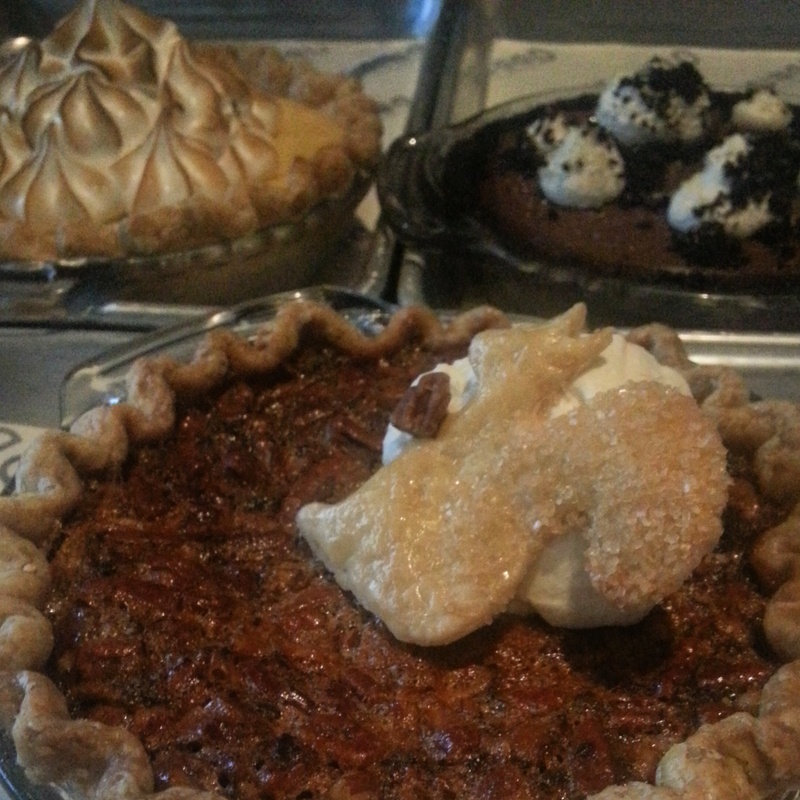 ); Sorghum Pecan Pie with Orange Zest Cream, Chocolate Pudding Pie with Bourbon Cream, and Lemon Pie with Toasted Meringue. While each one was amazing in it’s own right, that lemon. 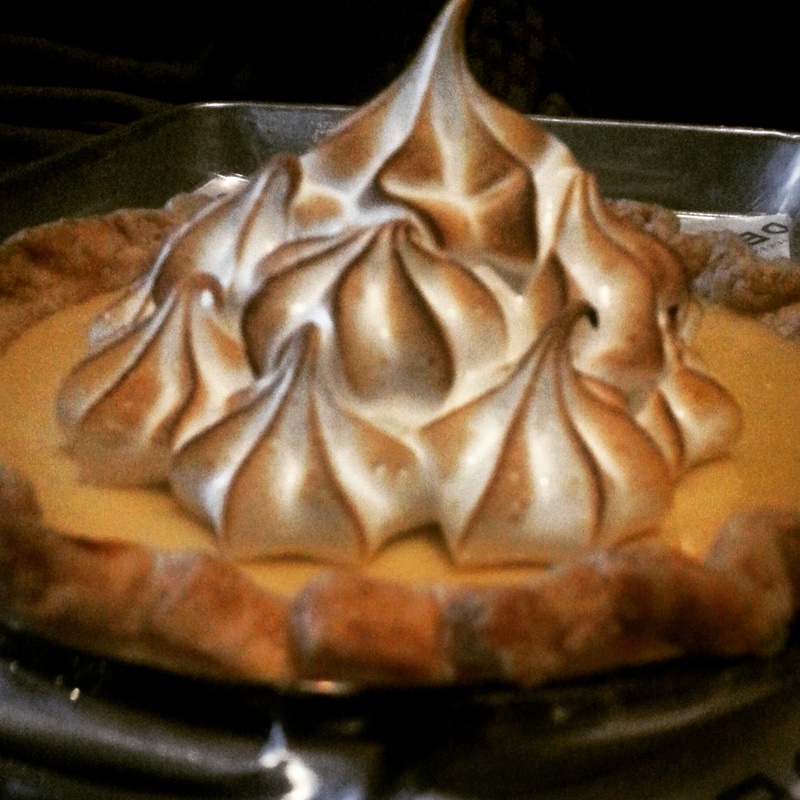 …that meringue on top of that lemon pie. That has got to be the absolute best meringue in Atlanta and better than my own. <– Another HUGE compliment 😉 The toasting was spot on, and the texture was similar to a light, whipped marshmallow cream. It was just unreal and I could have eaten that with a spoon. From the bowl. Maybe even without the spoon. What a fantastic ending. 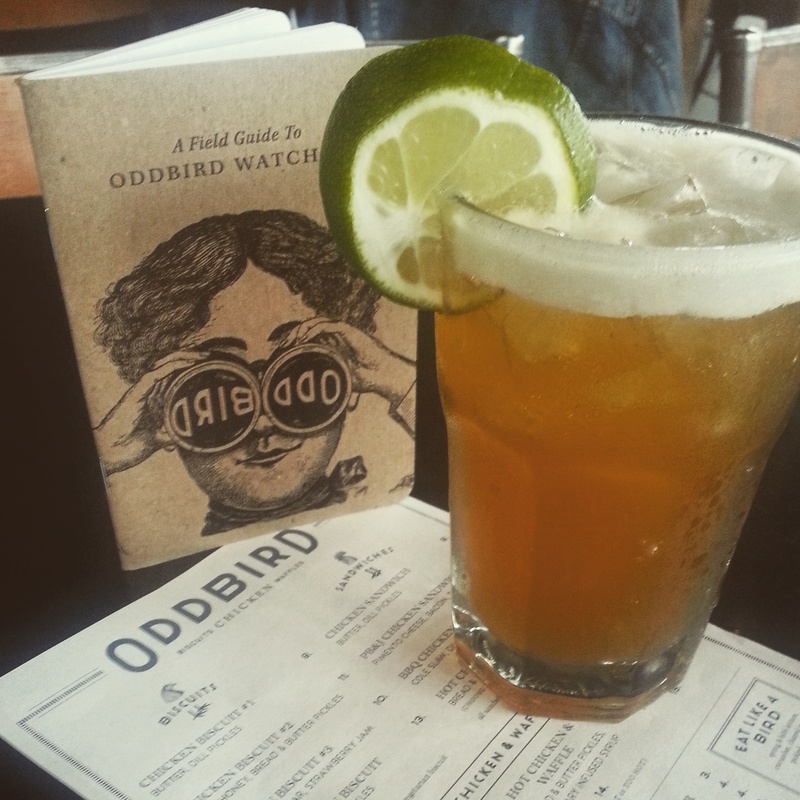 To spending some time getting to know a remarkable staff… I can tell you everything is odd about Oddbird. 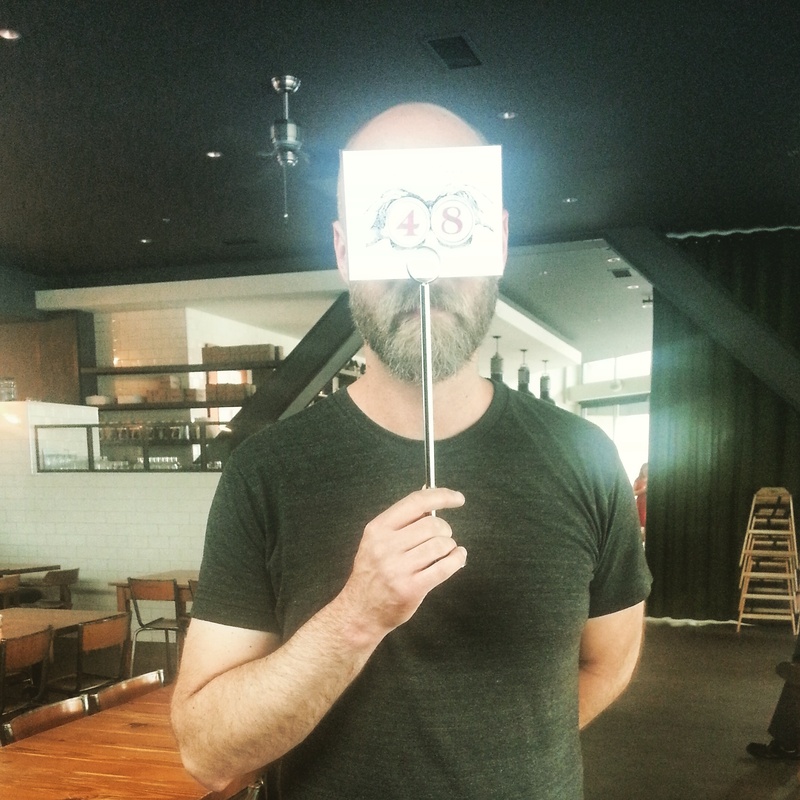 They are oddly creative, oddly incredibly energetic, oddly passionate about their menu and oddly crazy about their restaurant. I think we need more of their kind of odd. Thanks for offering the “full experience” Oddbird. 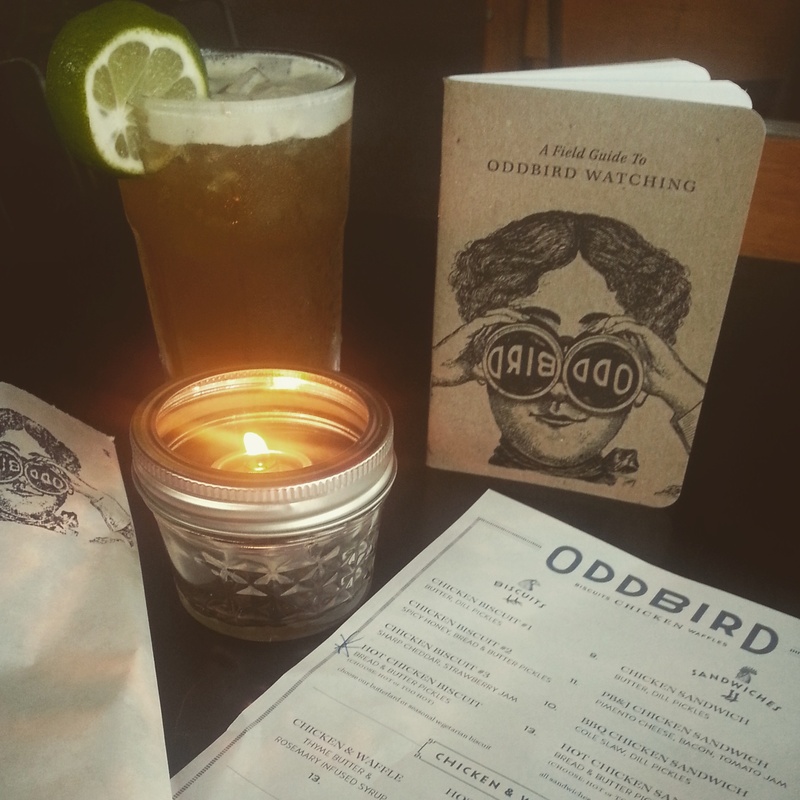 Disclosure: My food and beverage at Oddbird Cafe was complimentary, but all opinions, swooning, and drooling are my own.